I honestly look forward to coming home from work each night and cooking dinner with my husband. It's the one time of day we put everything else aside and focus on being together and creating the perfect meal. That being said, the last thing either of us wants after a long day at the office is to spend needless hours in the kitchen cooking. This is where Skillet Mediterranean Chicken comes in. 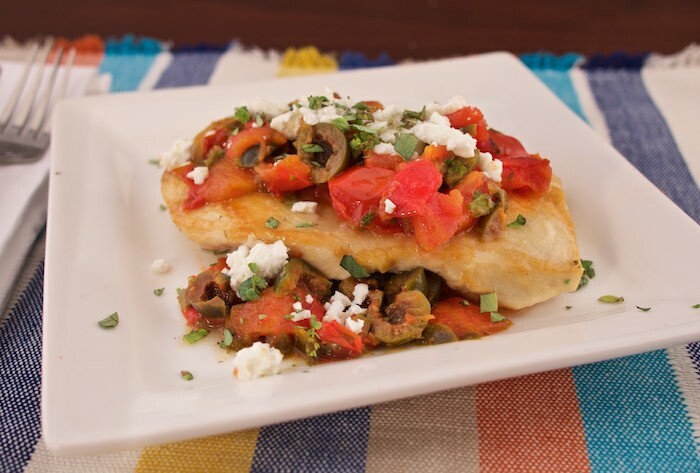 Pan-fried chicken breasts are topped with a simple sauce of capers, fresh tomatoes, feta, olives, and white wine. Ready in less than 30 minutes and full of flavor, this delicious chicken dish has become a weeknight dinner staple at our house. Place seasoned flour in a small bowl and dip the chicken breasts, thoroughly coating all sides. Heat oil in a large skillet and cook the breasts for 2-3 minutes on each side until browned and cooked through (internal temperature should read 165). Remove chicken from the pan and keep warm. Add the wine to the pan and raise the heat to high. Bring the liquid to a boil while you scrape the browned bits from the bottom of the pan. Once deglazed, add the tomatoes to the pan and season lightly with salt and pepper. Immediately add the capers and olives. Cook for 2-3 minutes more, until the tomatoes begin to break down. Place each chicken breast on a plate and spoon the tomato, caper and olive mixture over top. Add crumbled feta and sprinkle with oregano to serve. Love all the flavors here! Sounds delicious. I love Mediterranean flavors. They're opening a Sprouts right by my house! This looks great, I love olives and feta. Anything with feta gets the thumbs up from me. This looks delicious! Anything that's ready in a half hour sounds fantastic-- I love how easy this is! I love cooking with Mediterranean flavors and ingredients. This looks delicious. Nothing beats an easy and flavorful dish like this one! So many yummy flavors in one dish! Nom. Nom. Nom. What a great weeknight meal! I love making dinner at the end of a long day too - perfect way to decompress! This looks delicious, love the flavors! Ready in less than 30 minutes? Sign me up! Looks great! I love how quickly this comes together - and such great flavors! I love cooking with my husband. It's a great way to bond! This is something that we could make together pretty easy! Sounds delicious! I always love dishes with olives and capers, plus that feta on top sounds lovely. Love this! Mediterranean food is so fresh and delicious. Can't wait to try this out! Looks delish. Sounds easy. Bet it's tasty!! Thanks! I am a capers and olive fan! This recipe sounds so delicious. YOu have all of my favorite components of a chicken dish all in once place, mmmm. Extra capers please!